Duke’s Small Batch Smoked Meats is the newest line of jerky and meat sticks from Thanasi Foods, LLC. Based in Boulder, CO, Thanasi is known for other successful jerky brands such as Jim Beam Beef Jerky, Stubbs BBQ Beef Jerky, and Frank’s Redhot Beef Jerky. “Duke’s” is the nickname of Justin Havlick, the President and CEO of Thanasi Foods. As the story goes, back in 2004 Justin would smoke small batches of jerky using real smoke wood, using fresh ingredients from his kitchen, and slathered with a variety of popular sauces. As a result, the Duke’s line of smoked meats comes in a variety flavors, including those marinated in Jim Beam, Stubbs BBQ, and Frank’s Redhot, which Thanasi already has brand licenses with. 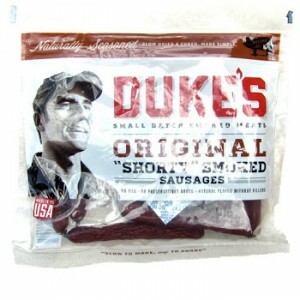 Duke’s Small Batch Smoked Meats has been distributing to convenience stores since December 2012. There’s a light saltiness just from the casing on these sticks. But when I chew, I pick up a heavier saltiness, along with a light smoky flavor, and a light bit of the natural pork flavor. 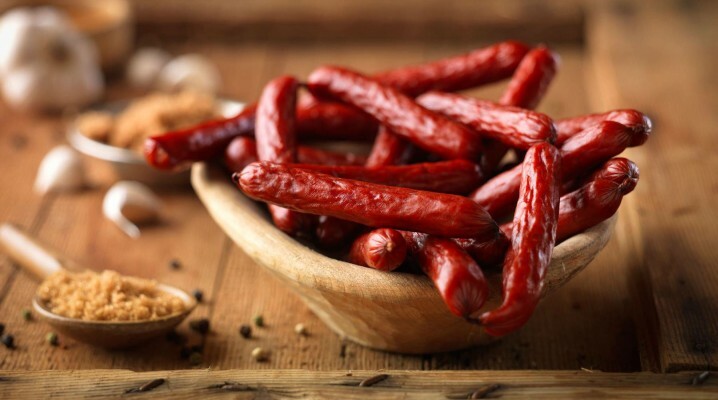 For being marketed as “smoked” sausages, they do indeed have a light smokiness, against a pork flavor much like slow roasted BBQ pork, but without the seasonings and sauces. Otherwise, the flavor that defines these meat sticks is largely a dominant saltiness, with a light smokiness and the natural, BBQ pork meat flavor. If you can imagine the flavor of baby back pork ribs, but without the seasonings and sauces, just the meat and a dominant saltiness, and that’s something similar to what I get from these sticks. It’s a mild flavor, aside from the saltiness, no spice or heat. These are made from pork, and cased into sticks of about three inches in length, with nearly the same thickness as a Slim Jim. It’s a dry stick, except for an oily inside, with a dry surface feel. There’s a nice “snap” and “crunch” when I bite into one. These are somewhat rigid sticks, not exactly soft or tender, but still easy to bite off and chew. They don’t present anything unchewable, and I didn’t encounter any hard bits of material. I’m giving this a good rating. These “Shorty” Smoked Sausages from Duke’s Small Batch Smoked Meats are actually rather addicting. They have a mild flavor in terms of spice, but are actually quite flavorful with a salty, smoky, roasted pork flavor, that reminds me of eating baby-back ribs minus the seasonings and sauces. There’s a nice crunch and snap when I bite into a stick, which I think is part of what defines a good meat stick. The meat is somewhat oily, but I didn’t encounter any hard bits of material. Overall, these sticks are easy to chew. “Roasted” is the word I keep coming back with when trying to compare these sticks to other brands. There’s a roasted feel as well as a roasted flavor, that somehow creates a lot of snackability. I’m only staying away from a 5-star rating because the flavor still needs something extra to push it over the top.